Most people would agree that democracy throughout the world is in deep trouble. From the polarizing politics of the United States to the endless refugee crisis in Europe to the rise in radical Islam, there is a widespread feeling that our way of life—political, cultural, and social—is under siege. But what if democracy itself is to blame? What if the current threats are not distortions of but inherent to democracy? What if the solution to our present ills is not “fixing” the system, but junking it entirely? Christophe Buffin de Chosal asks these forbidden questions, and answers them unarguably with Gallic wit and glittering style. If you read only one book on politics this year, let this be it! Foreword by Charles A. Coulombe. This is why the overthrow of James II in 1688 was a true revolution. It was not a popular revolution or the overthrowing of a tyranny, but it was the rebellion of a class implementing the transfer of sovereign power for its own profit. [On the French Revolution] It remained a bourgeois phenomenon, replacing the power derived from birth with that derived from money. It abolished the privileges of the guilds in order to give free range to the capitalists. It abolished the privileges of the peasantry in order to give the industrialists cheap labor. Nothing is more dangerous to democracy than the people. That is why democracy will always claim to serve the people while only permitting a small number to rule in their stead. What democracy demands from the people is legitimacy. It does not care about their opinion. Faced with these disparate interests, often complementary and at times conflicting, all the freedom and power of the monarchy was necessary in order to maintain the peace and the cohesion of the social body. A weak monarchy, as in England, would be subjugated to the interests of a more powerful class to the detriment of other classes’ interests. A strong monarchy could, after having listened to all parties, impose the decision which best served the common good, even against certain particular interests. Such a monarchy played the role of the arbiter among factions, a role that does not exist in democracy because its government is itself derived from factions. The concept of an organic society was abolished at the time of the French Revolution. The corps and orders were suppressed, the privileges were abolished, and everything which allowed the people to protect themselves from the power of the state was banished in the name of liberty. What were the people given in exchange? Sovereignty. They were given the false promise that they would no longer need to defend themselves from the state since they themselves were the state... This incapacity of the democratic people was intended and planned. A people incapable of exercising power over themselves are condemned to entrust their fate to their representatives, the political parties, who will thenceforth be the true sovereigns. They will exercise the power, legitimized by elections, over an unorganized people without natural defenses to face the power of the state.... This is how the people are regarded in a democracy: a formless and unorganized mass of indistinct individuals. They are like dough in the hands of the state. This people are deprived of organization in the face of the state. The sole organs of resistance which can raise their heads to the state are the political parties and unions—themselves politicized, that is to say under control. The people are condemned to have themselves represented by organizations which are designated to them and outside of which no legal representation is possible. They believe—because they have been told so—that the electoral process is the best way to have themselves represented, while in reality the purpose of the electoral system is not to represent the population but to ensure the elite have power that is regarded as legitimate. The people in a democracy are the object of all kinds of manipulations and deceptions. They were taken from the land by massive industrialization, instructed by compulsory education, and then informed by television. They believed this to be an effect of their liberation and social ascendancy. In order that they are oblivious to the chains which bind them, the people are filled to excess by a society of consumerism, are overwhelmed by advertising, and their will is eroded by hedonistic pleasures. They get over paying taxes by treating themselves to vacations. The ruling powers encourage them to do so, for inasmuch as they work and enjoy themselves, inasmuch as they pay taxes and consume, they are not involved in politics and they do their part to keep the system going. The individual therein is considered as human material—“the most important of raw materials”—able to be exchanged or manipulated at will. He is reduced solely to his utilitarian aspects of producer, consumer, and taxpayer. He is merely a tool programmed by the media and education, and distracted from his natural aspirations by occupational work (necessary to assure his subsistence and to repay his debts), leisure activities, and the material and sensual pleasures to which he looks forward. Much could be said about the psychology of political party candidates. The first thing one might notice is the metamorphosis of those who become political party members. If they have attended the meetings and registered as candidates, they have already crossed over mentally to the other side, to the side of power. They begin to reason like politicians, they start to justify abuses every citizen ought to be quick to condemn, and they become less sensitive to the foremost concerns of the people (even if they pretend the exact opposite). Their discourse becomes slippery. It is more and more out of step with that of the non-politicized people among whom they move about. The foremost concerns of their fellow citizens become less of a priority. They identify differently the evils from which society suffers and attribute to them causes other than those generally recognized. They go so far as to pretend that certain problems do not exist (such as high crime rates) or attribute erroneous causes to them (such as economic causes to high crime rates). Power, even before they exercise it, exerts on them a moral corruption and a mental deviancy. As soon as it does so, they no longer belong to the people who elected them, but to this machine of conquest for power that is the party. The political parties put forward those of their members who show themselves to be the best manipulators. But among these, only those who are the most open to being manipulated themselves accede to power. The ideal politician, on the other hand, is pliable, convincing, and a liar by instinct. He is not attached to any platform and has no ideological objective. The single thing to which he is truly committed is power. He wants its prestige and advantages, and seeks above all to be personally enriched by it. Any politician who presents this aspect is recognized as fit for power in a democracy. Abstentionism lifts a corner of the veil. It is an important indicator. Far from being indifferent to election results, abstentionists consider it useless to vote, either because the candidate of their choice has no chance of winning or because, in their eyes, the country will be governed in the same way regardless of the winning candidate. But when a party obtains an absolute majority, it can be tempted to put an end to the democratic system. Democracy is never protected from self-destruction. When the parties are too weak, it is the rule of the minority; when they are too powerful, they compromise the system. In both cases, democracy shows itself to be impossible. The reality is that democracy was invented for the purpose of bringing an oligarchy into power and keeping it there. The money powers—by this term is meant the large industrial and commercial groups, the energy and armament markets, and the banks—who do not form the majority of the population and operate as hidden minorities, seek to use political power, by means of proxies, to serve their own interests. It is the money powers that are the true masters of the democratic state. It is they, ultimately, who make the long-term decisions, present their viewpoints, and dictate the major courses of action of governments. According to the most recent estimates, there are some 15,000 to 30,000 lobbyists for various associations, companies, special interests, and ideological groups swarming like flies around the European Parliament...Such a concentration proves that lobbying yields results and reveals the true interests championed by lawmakers. It follows that the state, in its national form or even in the form of a supranational organization, is nothing more than machinery in the operation of the world’s major financial, industrial, and commercial interests. It is no longer in the parliamentary assemblies or in the governments that the major decisions affecting the fate of peoples or the future of societies are made. These decisions are made at the head of major money powers which hold consultative meetings that are sometimes public (such as the G7, G8, and G20) and sometimes secret (such as the Bilderberg Group), and which make use of proxy organizations such as the United Nations, the International Monetary Fund, the World Health Organization, the World Trade Organization, the World Bank, the Council of Europe, the European Union, etc. The opinion of voters has no weight and must not interfere. It is necessary only to take care to favorably prepare public opinion through the conduit of the media, in order that it accept as good or normal something it would instinctively reject if it were not conditioned. Public sentiment ... has been conditioned so much against any other form of government and it has become so convinced that democracy, in spite of its weaknesses, is the system of humanity par excellence, that it cannot admit that this sure system could also be, like so many others, called into question. It is necessary to recall here that the totalitarian governments which were established in the twentieth century all had their origins in democracy. All were born of electoral systems, and some of them conquered the state with the most perfect democratic legality. Dictatorial regimes, such as those of Napoleon, Hitler, and Lenin, were born in parliamentary lands where democracy reveled. Democracy was of no harm to them, it did not forestall them; on the contrary, it served them. These historical examples can be abundantly detailed and illustrated. One must not forget that the only dictatorial government known under the Ancien Régime was the one under Cromwell, champion of the parliamentary cause and author of the first genocide in modern history. Parliamentary democracy has been the ideal pathway to totalitarian and dictatorial regimes. The very foundations of democracy are of a totalitarian nature. Democracy is the system in which anything is legitimate from the moment it is wanted by the majority. Democracy, knowing neither good nor evil but only numbers, does not recoil from any decision or law that would be voted on democratically. The democratic state can euthanize the elderly and the demented, it can legalize drugs, and it can enable homosexual couples to adopt children. It can infringe on private property and tax without limit. The natural law does not constitute an obstacle for it. It can regulate everything, change everything, and even envisage reshaping man himself, through education, the media, the law, and advertising. Its power is limitless as long as society does not fall into revolution or chaos. It does not need to justify itself to do this. It does not need a police force. It suffices for it to rely on the support of a parliamentary majority. But the democratic state has no use for responsible citizens capable of exercising their judgment. It prefers to extend its empire over docile and dependent citizens. It prefers that the people seek to know what is permitted and forbidden rather than what is good and bad. The first attitude requires submission, while the second requires freedom. Democracy tends towards totalitarian government through legal pretensions designed as substitutions for morality. A government which does not recognize any moral law and for which good and evil do not exist, but only the will of numbers, opens before itself a field free to manipulation and oppression. In democracy, good and evil must become one with the law, for it is inadmissible that there should exist something superior to the law. It is striking to see how quickly a democratic population accepts as normal acts which it considered immoral, simply because they have become legal. Thus, wearing a safety belt inside a car has become a moral act because it is a legal obligation. Not insuring oneself when insurance is obligatory borders on immorality. Abortion and euthanasia, which revolted our grandparents, have become morally acceptable since being decriminalized. The salaries paid to political personnel, which constitutes an odious scandal in states claiming to be egalitarian, are generally accepted and at times even justified because they are legal. The number of persons dependent on the government directly (civil servants) or indirectly (entitlement recipients) is so great that one can say practically the entire population in a democratic country is dependent on the government for its subsistence. The government in effect subsidizes families, schools, hospitals, welfare programs, housing, a good portion of businesses, and so on, so that it is difficult, even impossible, to progress through life without having recourse to the intervention of public assistance. Only a tiny minority of the population can avoid this. Like the Soviet and Nazi totalitarian governments, the democratic state has succeeded in acquiring vast control over the population by making it totally dependent. Will a voter vote for the candidate who promises to help him or for the candidate who tells him he has to fend for himself? He will vote for the one who makes promises in his favor. Thus, democracy is always tending towards interventionism, for the voter is generally egoistic and self-interested, and he will cast his vote for the one who promises to make him the beneficiary of the maximum benefits that the state can offer. Individualism is inherent in every democracy. But the welfare state has propelled this tendency to limits not yet explored. Never has a population shown itself so greedy for the enjoyment of state benefits. It insists on maintaining these acquired entitlements, regardless of the consequences for the country as a whole. And in so doing, never has a population surrendered so much of its liberty in order to enjoy these benefits. The welfare state does not only offer its services to its population, but it also imposes them. It does not tolerate declining them. This fundamental right to be able to say no to a government service does not exist in democracy, for whoever would renounce retirement benefits, unemployment benefits, family allowances, free education, and so forth, would still be obliged to contribute to these services through his taxes. All of the educational systems have deteriorated in both formative quality and content during the past decades. One undoubtedly sees it when comparing the levels of difficulty of mathematical problems and texts imposed on students in 1910, 1950, and today. The decline is catastrophic. It is difficult to refrain from thinking that this is in fact a plan contrived to render the voter less instructed, less critical, more malleable, and more receptive to media propaganda. This fits perfectly with the objective of a government having totalitarian designs. A less critical citizen puts more trust in the state. He is more easily deceived by it. He is slower to defend his autonomy. He is the quintessential “human material” at the state’s disposal for consolidating the power and wealth of an oligarchy. Democracy has come to a point where the voters no longer vote for a candidate but rather against his opponent. It is often the case that the popularity of an elected government declines soon after it has assumed power, which clearly shows how much this popularity is based solely on words and images. After reality hits, popularity quickly dwindles. What might escape the attention of the political observer, however, is that the left always has a better chance than the right of getting elected. The left is naturally better situated to engage in demagogic discourse. It is the left that wants to indulge the population, to be generous and helpful, and to assist them in their difficulties. The right, in principle, promises liberty, which implies personal responsibility, risk, and inequalities. That man would be ready to pay this price for liberty is not a sure thing. Faced with a choice between the security promised by the left and the liberty promised by the right, the majority of the population will choose security....Thus, by its very nature, democracy drifts to the left. It is only in politics that decisions are made by means of universal suffrage. In every other human community, be it family, school, business, the civil service, or the military, decisions are never made this way. We rely on authority that is derived from age, responsibility, fittingness, or competence, but never on an authority that is derived from numbers. Democracy is a system that bases its decisions on the number of votes, on quantity rather than quality. It is a system that has no fundamental understanding of the concept of goodness. Instead of posing the questions: "Is this decision good? Is this opinion just?" it asks rather: "How many favor this decision or this opinion?" If one had talked of 50% taxation or legal abortion in 1930, or even in 1950, it would have provoked an almost universal reaction of disgust. The sensibilities of our grandparents would have been revolted by such reforms. Now they are practiced daily and amidst general indifference. It is remarkable to consider that democracy is a uniquely political phenomenon. It is only in politics that decisions are made by means of universal suffrage. In every other human community, be it family, school, business, the civil service, or the military, decisions are never made this way. We rely on authority that is derived from age, responsibility, fittingness, or competence, but never on an authority that is derived from numbers. This does not preclude consultation prior to making a decision, but it is not numbers that ultimately have the most weight. Has anyone ever heard of a business where the major decisions are made by giving the cleaning ladies and doormen the same vote as the managers and directors? Has anyone ever heard of a family or a school that left its major decisions up to the vote of the majority—the children? This is, however, how democracy claims to operate. In the functioning of democracy, there is this paradox: the qualities necessary to ascend to power through democratic vote are precisely what make for defective leaders. To rise to the head of a political party and to win elections at the national level, one must pander to the voters and tell them not what is, but what they want to hear. One must bow down to particular interests, especially to those of the money powers. One must not let any scruples get in the way; one must be about superficial externals rather than about substance; one must also be devoted to one's party. Democracy appears then as an anomaly in human behavior. It is cut off from the natural order insofar as man very rarely resorts to it outside of politics and almost always prefers another mode of decision-making. It is insane, therefore, to grant such an expansive power to a state which cannot pursue the good on account of its relativism and which, by its very manner of operating, drifts inevitably towards totalitarianism. If one adds to this the fact that the democratic state is in reality only a smokescreen behind which powers act to exploit the democratic system for their own particular ends, it becomes undeniable that democracy is the most deceptive and dangerous political system ever invented. What has the democratic state made of this society over which it has extended its empire? Has it sought to preserve it from moral degradation, or from the onslaughts of ideologies and particular interests? Has it established safeguards to protect the populations from the consumerism, indebtedness, and inflation which have served the money powers? The democratic state has done none of these things. Some might ask: Why do political leaders not see that this downward spiral will result in the total destruction of society and, ultimately, in the destruction of democracy itself? To ask this question is to credit our elected leaders with the loftiness of vision and high moral standards the majority of them do not have. It is to identify oneself with our elected leaders, which is a rather naive thing to do. If the voter only knew what kind of individuals his elected officials truly were, he would likely be horrified at the great chasm which separates them from him. Populism represents a danger for the political class in place because it threatens not only their power but also the particular interests of their bosses. Populism does not show itself ready to compromise the national interest, and therefore reveals itself better able to serve the common good than the private interests of pressure groups. Some think Christianity has a vocation to imbue democracy with values. They are right in theory, but they will labor in vain, for democracy is a relativistic system and is hostile to any moral constraints it has not given itself. What is more, Christians do not today constitute a real threat to democracy; on the contrary, they are its victims, something they are not yet ready to acknowledge. Christians working to stop abortion and euthanasia are still far from realizing that if there were a true representation of the people and a truly accountable and impartial executive authority, it is unlikely their fight would have ever been necessary. It is the triumph of some private interests, effectively served by democracy, which has permitted these spectacular advances in immorality. A true arbiter of the common good would have defended the rights of unborn children, and true representation by the people would have shown the disgust of the vast majority for this kind of murder. John Paul II recalled from time to time that a democracy without values differed little from tyranny, and Benedict XVI denounced the dangers of relativism multiple times. These pontiffs rightly pointed out that democracy should not be an ideology, but rather a simple system of governance and representation subject to moral imperatives; they made the mistake of believing, however, that democracy was such a system and that it could submit itself to “non-negotiable” values. Many indicators appear to agree that Western civilization is dying out, at least as we have known it from its period of decline since the French Revolution, and certainly since the end of the First World War. Democracy is largely responsible for this. Just as a living organism becomes more vulnerable and contracts illnesses when its immune system weakens, Western societies weakened by materialism, relativism, and other vices of the democratic ideology are also subject to all kinds of attacks. Democracy has been a system in perpetual degradation. It has participated in the decline of the Western world, being both its cause and its fellow traveler. It is a factor of "decivilization," and it leaves in its wake disappointed and politically immature peoples. Behind the screen of its rituals, it consolidates oligarchic totalitarian regimes which shall one day surprise people who believed themselves free. Progress can only exist when we are convinced we can do better and that things can be perfected. How is it, then, we became convinced we could do no better than democracy? DEMOCRACY is not just a political system. It is much more, and its nature approaches that of the gods if we consider with how much respect it is treated and with what devotion it is honored. The idolatrous character of democracy is clearly seen in the absolute refusal to question it in any way. Since the end of the last world war, the Western mentality has been as though traumatized by the experience of totalitarian and dictatorial regimes, in the face of which democracy has been presented as the unique means of safeguarding civilization and human dignity. Fundamental political criticism, the kind that questions political systems and their principles, is not applied to democracy, which is held as an essential good without which nothing is certain but chaos, oppression, and misery. Today no one is disturbed to hear about the United States wanting to institute democracy in the countries of the world where it intervenes militarily. We smile perhaps at the pretext, but not at the principle. We do not think twice about the incongruity of the matter since democracy is seen as the political system of man. It is presented as an unshakable truth or an irreversible acquisition of humanity. It is synonymous with progress. It passes as necessary and beneficial in all cultures and all parts of the world. It would be the universal political system, the final outcome of mankind’s long political journey. Because of this, it escapes all questioning and its foundations appear infallibly true. Is this not to forget that democracy is, after all, only a human invention? It is the fruit of philosophical thought and the result of historical circumstances. It therefore carries a certain risk of error. We can live in the conviction that humanity progresses unceasingly and that what is more recent is likely better than what was before—a conviction on which the contemporary mindset is largely based—but we should still not forget that every human invention is fallible and thus liable to criticism. To hold the contrary is foolish or pretentious. Besides, it is contrary to progress. Progress can only exist when we are convinced we can do better and that things can be perfected. How is it, then, we became convinced we could do no better than democracy? It is therefore not only permissible but also necessary to critique democracy. True democrats, if they are to be found, cannot be offended by this because they themselves champion freedom of expression as a fundamental right. True democrats bow before the majority opinion, not because it is true, but for the sole reason that it has the backing of numbers. Because of this, they should refrain from rejecting any opinion as being false, immoral, or scandalous. They should regard any opinion, even a minority one, as a potentially acceptable opinion, an opinion only needing the support of the masses to be accepted and respected. Such an attitude would be consistent with the principles of democracy. But true democrats are quite rare. There exist in democracy opinions for which you incur definitive censure. There are even some for which you are thrown into prison. Democracy, like any other system, fights tooth and nail to defend its foundations. It mercilessly crushes those who threaten it, and declares, with the coolest self-assurance, that it is on the side of good. To challenge such a conviction requires a serious argument which, as a lever, can shake and then topple over the bulk of the edifice. A perhaps overblown confidence in human reason enables us to think that when principles are shown to be false, that it is easy for any honest observer to detach himself from them and to take up again the search for truth. For what should we expect of erroneous principles, if not a deviating praxis? All of this would be very easy, of course, if democracy was only a political system. In its particular case, however, we come up against a considerable dose of the irrational. It is placed above reason. Its truthfulness stands outside of any proof or demonstration. It is reputed to be true, independently of reason, and what is more serious, independently of human nature. This is the trap one must not fall into. It is necessary first to question the principles and expose the deviating praxis in what one today calls “democracy.” It is necessary first, through a detached and rational examination of democracy’s vices, to work up to the conclusion that a better system is certainly possible. This patient and methodical approach does not allow the smugness of the opponent to intimidate. Challenging democracy, a system universally practiced, defended, and honored, is a risky undertaking most of our contemporaries will consider utter foolishness and the beginning of lunacy. Yet it is precisely the foolishness and lunacy of the democratic system that must be exposed. The critique of democracy is an act of confidence in man’s rational nature. It is to uncover the delusion and deception of which humanity—the Western world in particular—has been the victim since the time of the French Revolution and even earlier. Thus, what you are going to read presents at each moment the two facets of democracy: the delusion and the deception. The delusion consists in believing that a political system which is unrealistic, artificial, and directly at odds with human nature could contribute to mankind’s happiness. Because it claimed to be rooted in lofty principles, the democratic ideal had to be true and good, regardless of any rational observation to the contrary. This delusion has accompanied all democratic and democratically derived systems up to the present day. Then, there is the deception, because this delusion has veiled the fraud and sordid machinations of those who have exploited democracy to serve their particular interests. The two elements are inseparable and have been found side by side from the beginning of democratic ideas up until democracy’s everyday practice in our own time. To speak of the end of democracy does not therefore have as an objective, as one might expect, to worry and alert consciences in order to try at all costs to save it. Democracy has been a system in perpetual degradation. It has participated in the decline of the Western world, being both its cause and its fellow traveler. It is a factor of “decivilization,” and it leaves in its wake disappointed and politically immature peoples. Behind the screen of its rituals, it consolidates oligarchic totalitarian regimes which shall one day surprise—indeed, this day has already come—peoples who believed themselves free. "This book may well be one of the most important you have ever read." - Charles Coulombe, author of Puritan's Empire. 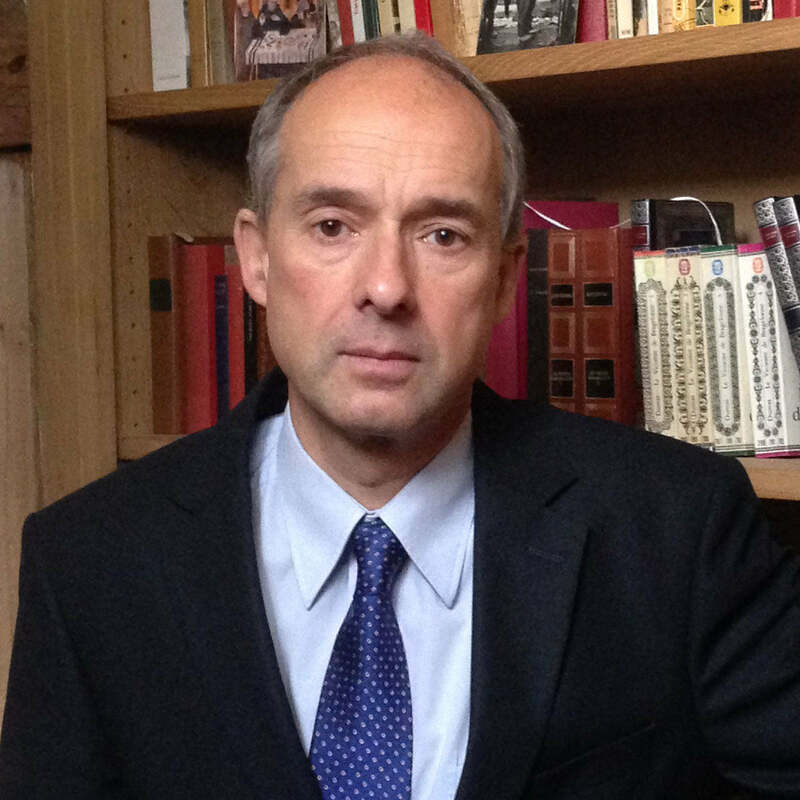 Christophe Buffin de Chosal is a Belgian historian and a writer. He is married and the father of six children. He lives in Belgium. He has worked for 25 years as a high school and university teacher in the fields of History, Economics and Politics. His main fields of expertise are Medieval and Modern History, Modern and Contemporary Politics. Since 1988, he has written articles for Correspondance européenne, a French-speaking press agency based in Rome. Good subject matter. Bought it as gift. Want to buy one for myself. I am excited to read it. Christopher Buffin de Chosal manages to erase all of my misconceptions about democratic governments that I've held in certainty since my schoolboy days in 161 pages. He manages to expose democracy as not a system of the state giving the masses power, but rather one of the ruling class obtaining legitimacy from the masses. Overall, this is a very good read. I only did minimal reading every day, and I managed to finish the book in two weeks. Highly recommended to fellow conservatives to realize that democracy was never meant to function in favor of their interests. Ultimate red-pill book loaded with truth bombs. This book will blow your hair back. I read this with a pen and marked every line that I felt was a standalone quote worthy of being posted on the internet. In total I ended up with over 40 quotes. There are so many truth bombs in this book, it's truly unbelievable. Whenever I encounter someone in a political argument, I suggest that they read this book, address its arguments, and then get back to me! Very little reading time wasted, if nothing at all, bravo! Everyone recognizes that modern democracy and representive republics have become wholly corrupted, representing only the interests of moneyed powers and radical ideological groups, but what is seldom recognized is that this end was initially intended by design. The End of Democracy exposes that end, and yet points also to its looming and inescapable final end.